This paper performs a comparative assessment of Russian technology employed in contemporary fighter aircraft and associated systems and weapons. Models of future air combat are defined and discussed. All categories of basic systems technology are then consecutively compared against their US or other Western equivalents. Finally, fighter types are compared to the first order. In conclusion, the notion that contemporary production Russian fighters are inferior in technology, performance and overall capability to their US/EU peers is largely not correct, and predicated on assumptions about Russian technological capabilities which ceased to be true a decade or more ago. Russia's military aircraft manufacturing industry is riding high at this time, with massive and ongoing orders for hundreds of modern fighter aircraft since the end of the Cold War, primarily delivered to clients in Asia. India is acquiring what is likely to be in excess of 200 Su-30MKI Flanker H, China has cumulative orders for more than 400 Su-27SK/J-11A Flanker B, Su-30MKK/MK2 Flanker G, Su-33 Flanker D, and Su-27SKM Flanker B+, Malaysia is receiving its first Su-30MKM Flanker H+, Vietnam and Indonesia now operating mixes of Su-27SK/Su-30MK Flanker B/G, Venezuela has ordered the Su-30MK, as has Algeria. 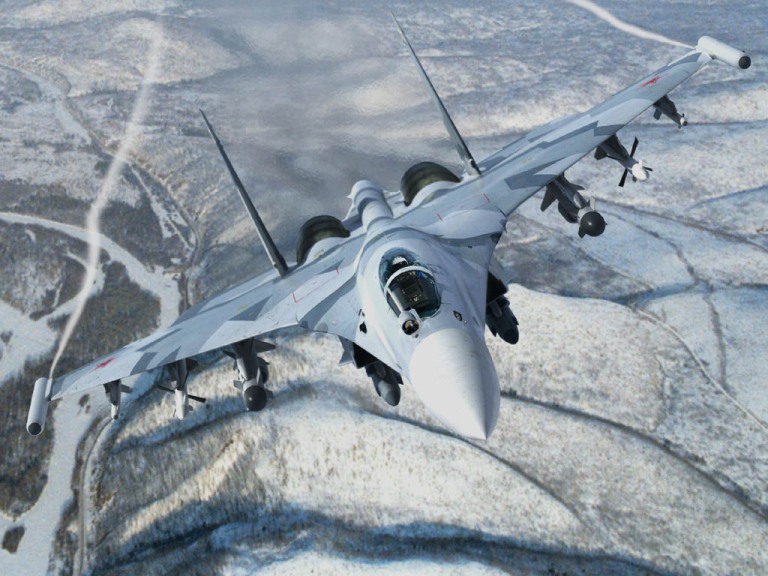 Speculation continues over Iran's claimed intent to buy 250 Su-30MKM, while India assesses the new AESA equipped MiG-35 Fulcrum F. Rosoboronexport is diligently marketing the new Su-35 Flanker E+, recently unveiled at the MAKS2007 air show. Western analysts remain divided over the explosive growth of Russian fighter sales. Some still see these aircraft to be in the class of Cold War designs, lagging behind Western equivalents, others are often uncritically enthusiastic about these aircraft. Where does the truth lie? Aerial combat in the coming decades will be dominated by players who have command of information over their opponents, and are able to exploit that advantage offensively. Information has become the new high ground in the game of aerial combat. Globally, and especially in Asia, this has been reflected by sustained high levels of investment in capabilities historically operated only the US and NATO nations, such as AWACS/AEW&C and networking of combat aircraft, AWACS/AEW&C, and ground based surveillance systems. Concurrently we have observed strong investment in counter-ISR systems, intended to render AWACS/AEW&C impotent. Such systems include very long range air to air missiles such as the Russian R-37/AA-13 Arrow and R-172/K-100 intended to destroy AWACS/AEW&C, but also capable ground based jamming systems like the SPN-2/4/30 series, Pelena 1, Topol E and supporting ELINT systems like the Orion/Vega 85V6 series. There are two fundamentally different views currently espoused in assessing the future of aerial combat. One view, popular in some Western defence bureaucracies is the 'asymmetrical model' of aerial warfare, which makes the assumption that Western nations will have a one-sided advantage in combat conferred by the possession of AWACS/AEW&C and networking, which is uniformly assumed not to be a future capability operated by any potential opponents. On this basis, it is then assumed that fighter aircraft can have low performance as their role in aerial combat will be primarily as stand-off missile trucks, shooting at opposing combat aircraft in long range beyond visual combat. As the opponent is assumed to always be dumb, and neither operate AWACS/AEW&C and networking, nor be capable of understanding the situational picture, the low capability fighter is assumed to prevail most of the time. 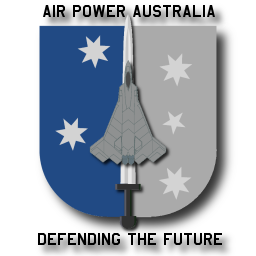 The best regional example of this philosophy in practice is the Canberra DoD which has elevated the low performance F/A-18F and JSF above the F-22A Raptor using the 'asymmetrical model' as a justification. The much more conservative view of future aerial combat is the 'symmetrical model', which assumes that all substantial players will own and competently operate AWACS/AEW&C and networking, and will deploy ground based jammers and long range counter-ISR missiles to threaten all airborne ISR capabilities. The most visible proponents of the 'symmetrical model' are the US Air Force, who have invested heavily in the very stealthy supercruising F-22A Raptor precisely to be able to penetrate deeply into hostile airspace and kill off an opponent's AWACS/AEW&C, and other ISR and counter-ISR assets. In practice, we can expect the 'symmetrical model' to play out across the battlespace, with both sides jamming each other's ISR and networks, and aiming to shoot down each other's ISR platforms. Whether an AWACS/AEW&C platform is killed by a 200 nautical mile range R-172 missile or an F-22A armed with an AIM-9X or AIM-120D is an entirely academic argument. It is entirely possible that in some conflicts the attrition or high risk of attrition of ISR platforms may force both sides to withdraw them rather than lose them, leaving fighters to fend for themselves, creating an environment not unlike the air battles of the 1940s. 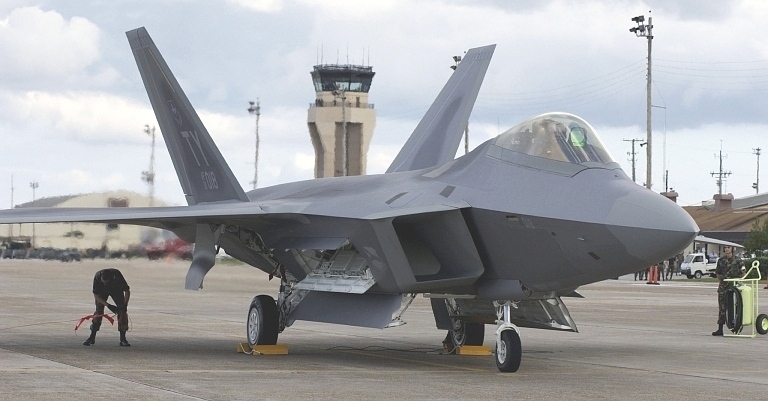 The US Air Force are seeking around 400 F-22A Raptors for precisely these reasons, but have been repeatedly frustrated by the Washington DoD bureaucracy who are unwilling to release the necessary funds. While we have seen little in the way of rational argument to support this conduct to date, what little argument is visible tends to be manifestations of 'symmetrical model', i.e. “advanced F-15Cs are good enough since we have AWACS and networking ....”. Analysts who have studied Russian technology exports and counted the ongoing sales of fighters, missiles, AWACS/AEW&C aircraft, networking, ELINT and jamming equipment, uniformly share the view that the reality of future air combat will be much closer to the 'symmetrical model' than the 'asymmetrical model' seen over Iraq in 1991 and 2003, and over the Bekaa Valley in 1982. Nevertheless defence bureaucrats in many Western nations remain firmly wedded to the 'asymmetrical model', with its implicit assumptions of Russian inferiority in all basic technologies used for air combat. In sizing up Russian combat aircraft against their Western rivals, the nature of future air combat is critical, since it determines what priorities should be applied to specific capabilities and performance parameters in fighter aircraft, their systems and weapons. Basic technologies determine what kind of airframes, propulsion, systems and weapons can be employed by either side in a conflict. The side with a significant lead in basic technology will prevail, all else being equal, due to the performance and capability gains that lead confers. Perhaps the most foolish of the popular misconceptions of Russian basic technology is that which assumes that the US and EU maintain the technological lead of 1-2 decades held at the end of the Cold War. Alas, nearly two decades later, in a globalised, digitised and networked world, the US retains a decisive lead only in top end stealth technologies, and some aspects of networking and highly integrated systems software. The Russians have closed the gap in most other areas, but importantly, have mastered the difficult embedded software technology so critical for radar and electronic warfare systems, as well as sensor fusion, networking and engine and flight controls. The Russians are working very hard at closing the remaing gap, with the planned PAK-FA fighter to be properly shaped for low observable and very low observable stealth capability. The latest Russian MiG-35 Fulcrum F and Su-35-1 Flanker E+ both illustrate this in a very convincing manner. Radar – the MiG-35 Fulcrum F is equipped with a Phazotron Active Electronically Steered Array (AESA) which is the same basic technology used in the F-22A's APG-77, the F/A-18E/F's APG-79, the F-16E's APG-80 and the Eurofighter's AMSAR. The Su-35-1 Flanker E+ is currently intended to carry a 20 kW hybrid ESA Irbis E radar, which is comparable to the technology in the Rafale, but boasts the largest antenna in any agile fighter, and peak power and range performance claimed to be competitive against the F-22A's APG-77. The Russians have also invested considerable effort into modern radar pseudo-noise waveform coding techniques, a key feature in recent US radars. In terms of technology the US now has only an incremental lead in active TR module technology and software, and EU little if none. Given the larger size of Russian radars compared to their US peers, in terms of raw range performance the Russians equal or better all except the F-22A's APG-77. 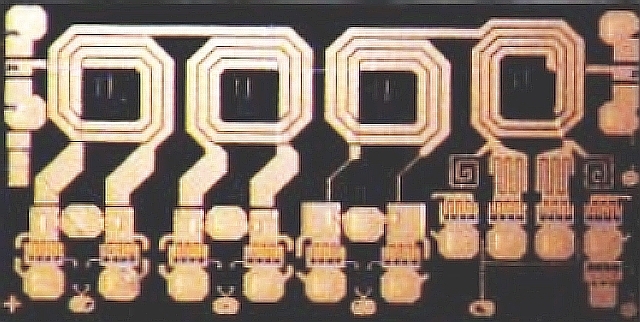 The Zhuk MSF/MSFE (above) is a passive ESA design intended to compete against the NIIP N011M BARS. It uses a Phazotron unique radial distribution arrangement in the backplane waveguide feed, and proprietary radiating element placement. The Zhuk MSFE has a .98 meter diameter aperture with 1662 radiating elements, and was developed for the Su-30MK3 Flanker G avionic suite intended for the PLA-AF. Radio Frequency Threat Warning – RF threat warning systems, comprising radar warning receivers, Radar Homing and Warning Systems, and Electronic Support Measures, have seen aggressive growth over the last decade with the advent of high density Gallium Arsenide or GaAs chips, commercially used in TV and mobile telephony. The most capable Western system is the F-22A's ALR-94 which is a channelised receiver, while the latest Russian Khibiny M system intended for Su-35-1 Flanker E+ is also a channelised receiver. What incremental lead the US and EU retain is primarily in GaAs chip packaging and software. Russian manufactured GaAs 4-bit phase shifter MMIC die. Radio Frequency Jammers – the most important developments over the last decade have been the advent of Digital Radio Frequency Memory (DRFM) and towed decoy technologies. The Russians have mastered the former and have offered it for export (MSP-418K) some years ago, and are now offering the Lobushka towed decoy, claimed to be comparable to the US ALE-50. 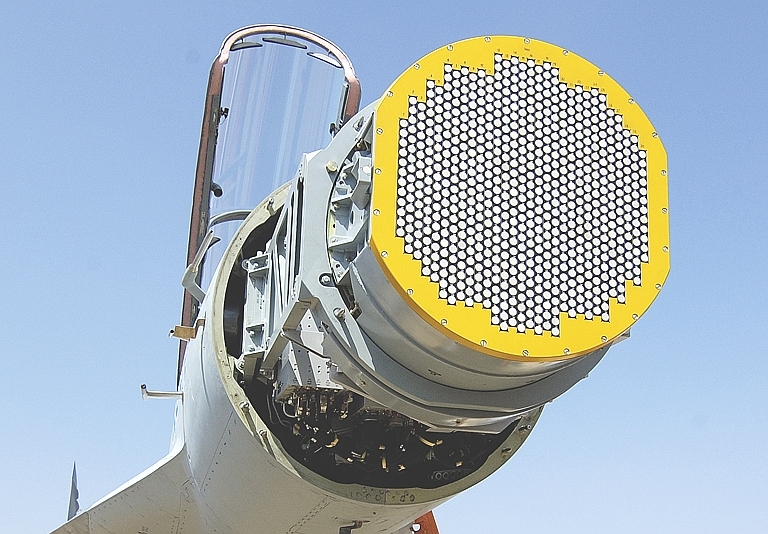 Some Russian jamming equipment is much more refined than Western equivalents, the KNIRTI Sorbstiya jam pod carried by numerous Flanker subtypes boasts a wideband phased array RF stage, much more effective against monopulse emitters, and more sophisticated than the wideband horn or lens emitters in Western equivalents. 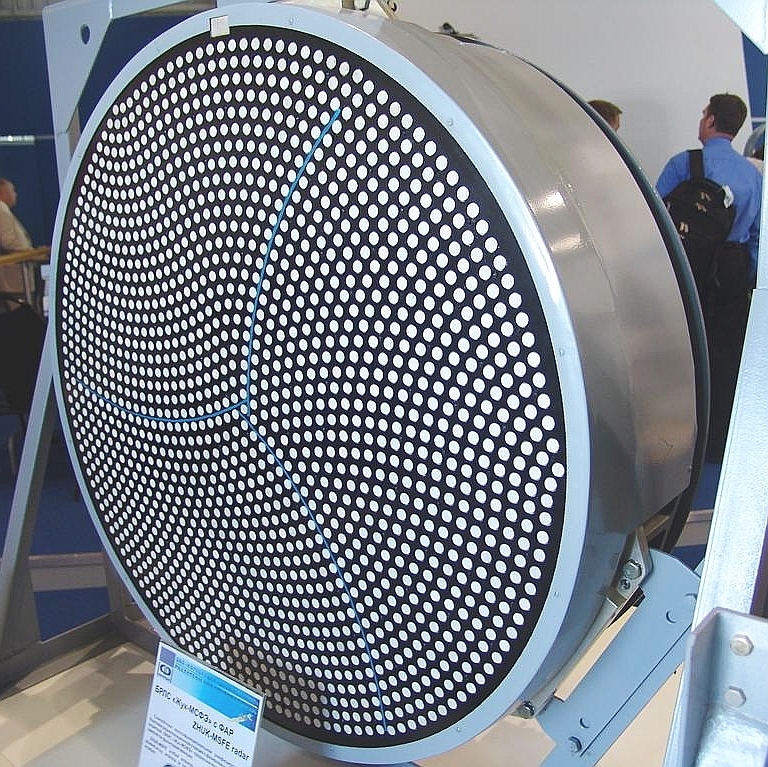 Monolithic Thermal Imagers – the EU holds the lead in this technology with production dual band Quantum Well Imaging Photodetector (QWIP) technology, unlike the US and Russia still in the latter development stages. In deployed systems, the US generally still retains a lead with midwave InSb technology. Given the commercial accessibility of such devices, Russia is likely to be integrating them into systems within 3-4 years. Supercooled Engine Blades – the Russians announced over a year ago low rate Initial Production (LRIP) of the AL-41F engine, designed originally as a supersonic cruise equivalent to the F-22A's P&W F119-PW-100. The hot end technology used in the AL-41F core has since migrated also into the AL-31F-117C variant for the Su-35-1. 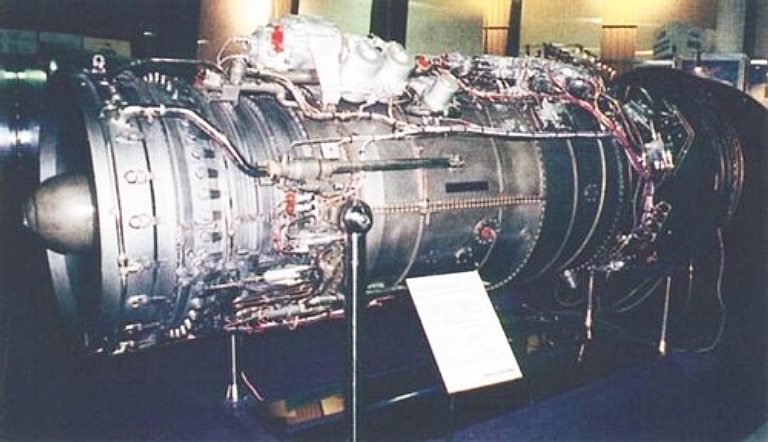 Cited performance figures for these engines indicate the Russian industry has closed much of the gap the US opened with the F119/F135 family of the engines. Engine FADEC – Full Authority Digital Engine Control systems are now available for a range of more recent Russian engines, including the AL-31F-117C. Whatever lead US and EU manufacturers may have is now only incremental, and mostly in maturity of software. Thrust Vectoring Nozzles – to date the only full production Western air combat fighter with TVC capability is the F-22A, while the Russians have exported 2D TVC in the Su-30MKI, and offered 3D TVC for other types. Russian TVC is integrated with the flight controls, not unlike the F-22A arrangement. Digital Flight Control Systems – the Russians demonstrated their first quadruply redundant DFCS in the Su-37 during the 1990s and now offer it as an option for the Su-30MK series, Su-35 and likely as an MLU option for Su-27SKM rebuilds. The only incremental advantage held by US and EU manufacturers is in greater maturity of embedded software, an advantage which will not last. Radar Absorbent Materials and Structures – the US still retains a lead in this technology, but the Russians continue to make robust advances in coatings, laminates, and other controlled impedance technologies. Much of the Russian effort to date has been focussed on reducing the signature of conventional aircraft, rather than the US focus on fully shaped new designs. 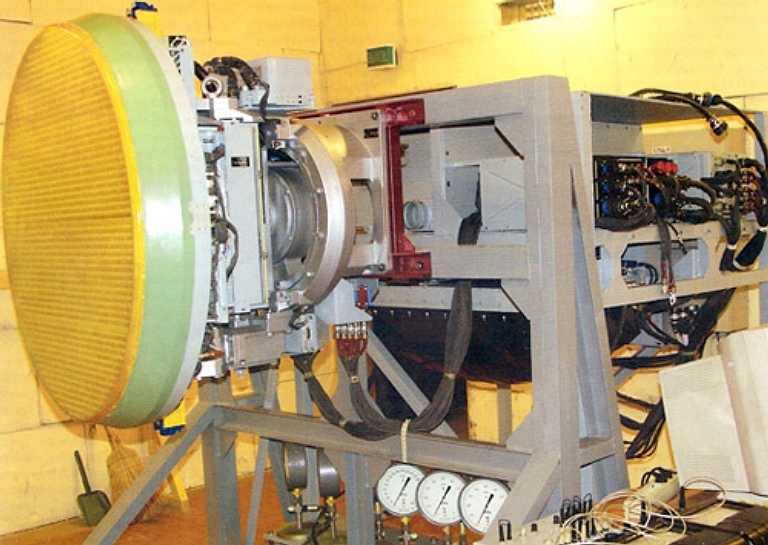 Russian Kazantsev laminates have demonstrated 100 fold signature reduction in the X-band, and recent citations indicate that robotically applied inlet tunnel coatings (Flanker) have achieved a 30 fold reduction in X-band signature. These are significant performance achievements, insofar as they challenge existing reduced signature US designs like the F/A-18E/F. While the US still leads at the top end of this technology, the Russians have closed much of the gap in 'commodity' technologies for treating conventional and legacy fighters. Airborne Datalinks and Networks – the Russians have long been users of digital datalinks, primarily for GCI and AWACS support of interceptors. During the 1990s they invested heavily in intraflight datalink technology intended to network flights of fighters, and the TKS-2 system currently exported on Flankers provides the capability to share sensor data between multiple aircraft. The Russians are now offering an equivalent to the JTIDS/Link-16 system on their latest fighters. What advantage the US and EU retain in this technology is primarily in the maturity of software and protocol designs, another gap which will not last. Inertial and Satellite Navigation Equipment – the advantage held by the US over Russia at the end of the Cold War has largely evaporated in this area, in part due to the wide availability of RLG and GPS technology in the global market. The US still retains a strong lead in wide area differential GPS technology. Glass Cockpit Technology – the US introduced Active Matrix LCD panel displays during the early 1990s, with the Russians closing this gap using commodity technology some years ago. 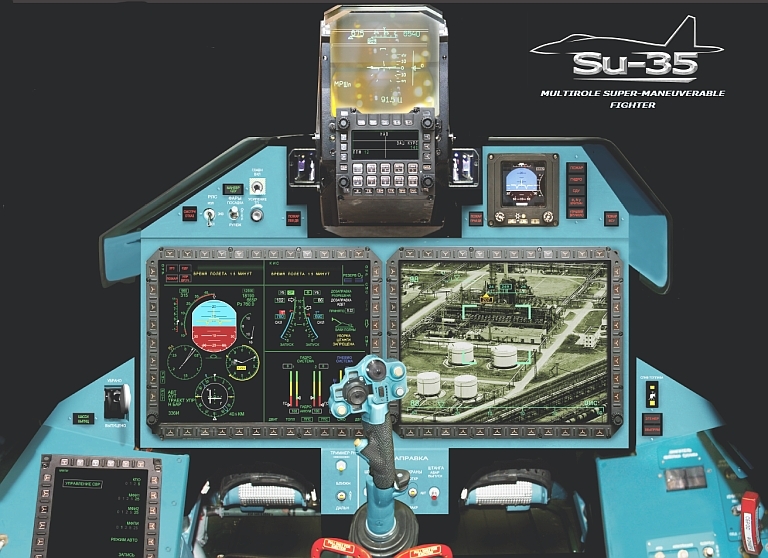 All current production Russian fighters use glass cockpits, and the Su-35-1 will employ two large area panels emulating in AMLCD technology the projector screen arrangement in the Joint Strike Fighter. Agat AAM seekers. 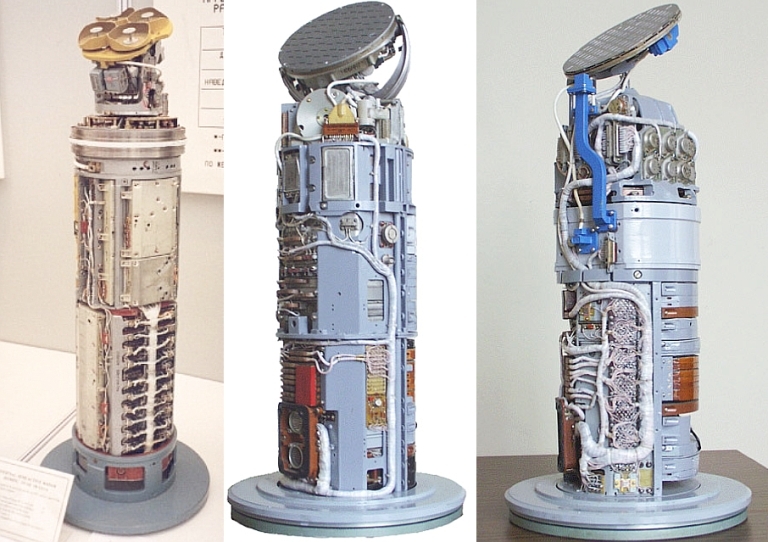 Left to right: 9B-1101K dual plane monopulse semi-active homing seeker used in R-27R1/ER1, 9B-1348E active radar homing seeker used in R-77 variants, and 9B-1103K active radar homing seeker for R-27EA (Agat). Active Radar Guided Missile Seekers – At the end of the Cold War the US led globally with the digital AIM-120A/B AMRAAM and AIM-54C Phoenix missiles. Since then the Russians have closed much of this gap with the R-77 Adder's Agat 9B1348, and its derivative 9B1103M for the R-27 missile. The most recently reported subtype of this seeker uses the same Texas Instruments TMS320 digital processor as is used in most Western radars and seekers. What technology gap remains is in the maturity of embedded software and packaging. ElectroOptical Guided Missile Seekers – the latest scanning digital seekers used in the R-73/R-74 Archer series of heatseeking missiles are a generation behind the seekers in the AIM-9X, Python 4 and ASRAAM, but given the ease with which Rafael produced the EO guided Python 5, this gap could close very quickly. The lack of Russian investment in this area suggests that the capability of the late model R-73/R-74 is regarded to be adequate. Guided Bomb Technology – since the end of the Cold War the Russians have widely expanded the technology they employ in smart bombs. The KAB-500/1500 series is a hybrid of aerodynamic features from the US HOBOS and Paveway series, available with Lock On Before Launch Electro-Optical Correlator guidance comparable to the EGBU-15 series, semi-active laser homing guidance comparable to the Paveway series, and most recently satellite/inertial guidance comparable to the JDAM series. The only decisive technology lead the US holds is in the GBU-39/B Small Diameter Bomb. All of the mature US, EU and Israeli guided bomb types are now matched by a range of Russian equivalents. What this excruciating survey of basic technology tells us is that there is little to differentiate the basic technology which goes into a current MiG-35 or Su-30MK/35 and that being put into a current production F-15SG or F/A-18E/F Block II Super Hornet. In most technologies the Russians have matched and in some instances even outperformed US and EU manufacturers. The main advantages still held in most categories by the US and EU are in maturity, and this is only a short term advantage. In turn, what this tells us is that in most of the sensor, systems and weapons technologies which go into a conventional fighter, the Russians have caught up with and in some areas exceeded the capabilities of the US and EU. Comparing then fighters type by type, accounting for comparable systems and weapons, the determinant of superiority will lie in conventional metrics such as sustained top speed, acceleration, climb rate, specific excess power, and instantaneous and sustained turn rate. An earlier, abridged, version of this paper appeared in the January, 2008, issue of Defence Review Asia.